If you’re in a hurry, check out our top pick, Gesture by Steelcase. If there is anyone factor that you can change to make spending eight hours a day in an office easier, it’s your chair. There is no shortage of evidence proving that being stuck in a chair for too long can increase the risk of cardiovascular disease and worsen back pain. In fact, sitting too much is even called worse than smoking. Many people who have office jobs develop problems like numbness, spinal misalignment, joint pain, neck pain, and herniated discs — usually from sitting too long on a poor quality chair without support. While you probably do not want to spend a lot of money on a chair, a high-quality ergonomic chair is an investment in your health, comfort, and productivity. Two separate studies, published in 1990 and 2003, found productivity goes up more than 17% when individuals work in an ergonomic setting with an adjustable chair. The right chair combined with ergonomic training can also reduce workplace injuries. Even if you do not already have wrist or back problems, an ergonomic chair can help you maintain the right posture to avoid strain, carpel tunnel syndrome, lower back pain, and spinal disc injury. The National Institute of Health recommends choosing a chair with all of the necessary adjustments to support proper posture. This includes a chair with casters and a five-point base; a seat pan with dense, small-cell foam padding or coils; a backrest that is either curved or small enough to fit the small of the back; soft armrests with an adjustable height and width; a hydraulic seat heat adjustment feature; and a tilt adjustment to transfer some body weight to the chair’s backrest. If you’re not working with a budget, why not get the very best? The Embody Chair by Herman Miller is the first chair made with a health-positive design. 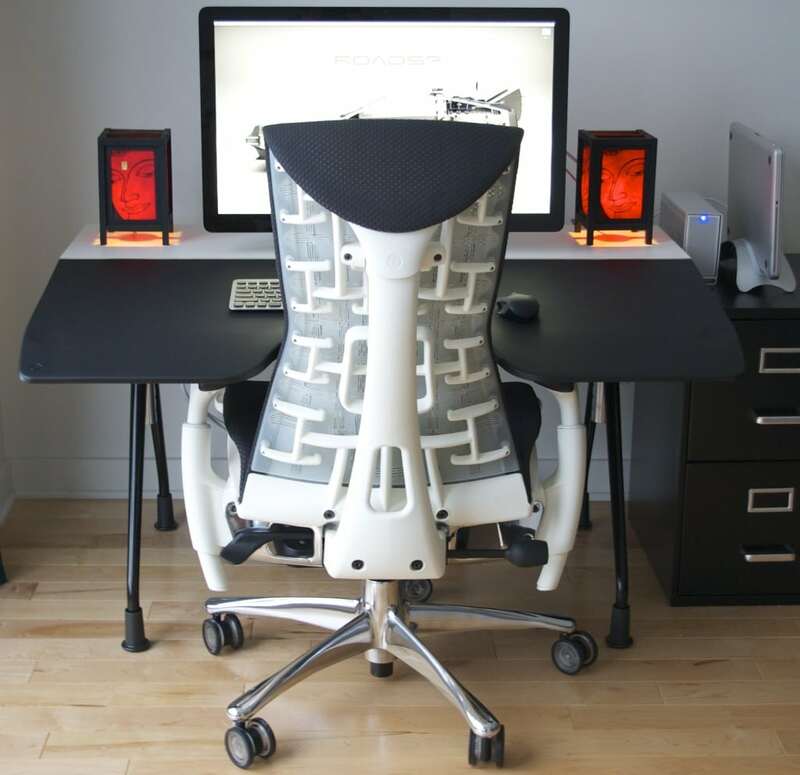 It was designed by Bill Stumpf, who created the original Aeron chair, and Jeff Weber with a goal of supporting healthy circulation and making sitting for hours a day easier on the back and spine. Physicians and engineers were also consulted to create the specifications for the Embody, which features a unique exposed exoskeleton made to mimic the human spine. The chair’s back moves with you throughout the day, keeping your spine in alignment and supporting the lower back, all without any adjustments on your part. This chair is so amazing, in fact, that it has won several awards, including the prestigious Silver award from NeoCon and a Best of Tech award. Watch this video to learn more about how the Embody is good for your health. If you are looking for an ergonomic chair that will fit in your budget, here are our picks for the 10 best ergonomic office chairs for your work space to counteract neck and lower back pain and help you stay comfortable and productive. An ergonomic office chair can do wonders to alleviate lower back pain that can affect you long after you leave work for the day. If you already suffer from back pain, it’s important to understand that long hours in a chair compress the discs in your lower back, which eventually begin to wear down and cause sharp or chronic pain. This pain can be severe enough to affect your mobility for the rest of your life. The good news? It’s never too late to treat the problem and give your aching back the support it needs. The following chairs are the highest-rated options for every budget to free you from long days of an aching back and help you concentrate on work — then forget about the day at the office when it’s time to go home. 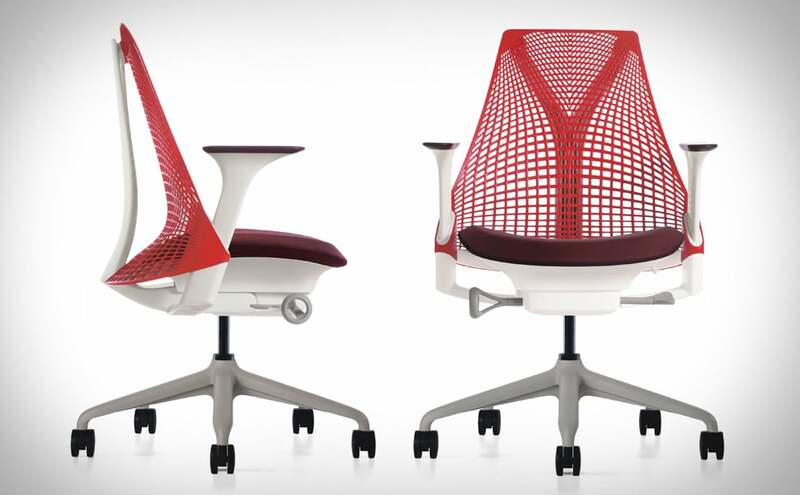 The award-winning Gesture chair from Steelcase is one of the finest ergonomic chairs money will buy. This revolutionary new office chair is designed to accommodate a variety of natural body positions and sizes, all while supporting and protecting the back and neck. Gesture uses exclusive LiveBack technology that automatically adjusts to your body, mimicking the natural movement of your spine and neck. The arm rests on the chair have been especially designed to allow for a variety of postures. One of the problems with many office chairs is that they simply don’t offer much freedom of movement. However, the human body naturally changes positions on a regular basis to keep comfortable. By placing the arm rests further back, it accommodates this natural restlessness, offering you more positions where you can be supported. The arms can also swivel with 360 degrees of motion, literally supporting your arms in any possible position. Not only can you adjust the height of the chair, you can adjust the tension it offers your back. This can help make the chair firmer or softer, supporting you no matter how your body feels on any particular day. Gesture won the Neocon Gold award in 2013, and is available in eight different colors, so you can always feel good about how your chair looks as well as how it functions. The Herman Miller Aeron Chair has developed quite a following over the years as the chair that started the ergonomic craze. The chair was designed for Herman Miller by Don Chadwick and Bill Stumpf and it was the very first to feature a woven seat and back without foam cushions. 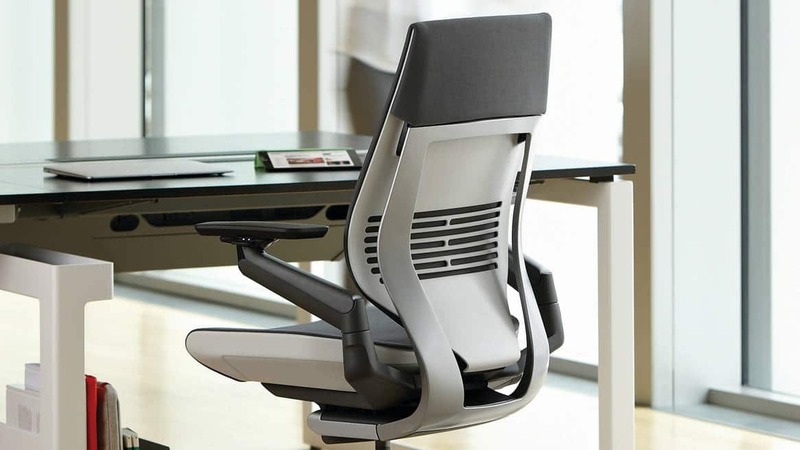 The Aeron is based on the biomorphic principles of the body for ultimate comfort. It also helps combat lower back pain in particular with a high back and a head cushion that allows you to rest your head while still maintaining correct posture. The Aeron chair is available in sizes A, B, and C, each of which is created to give you the most adjustable and comfortable experience. 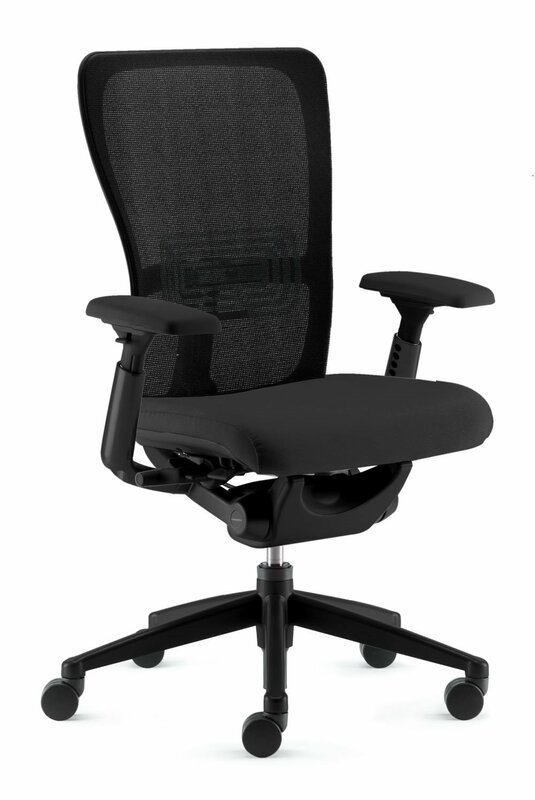 As popular as the Aeron chair is, it does have competition with the Haworth Zody chair. The Zody chair is the only chair to ever get an endorsement from the American Physical Therapy Association. 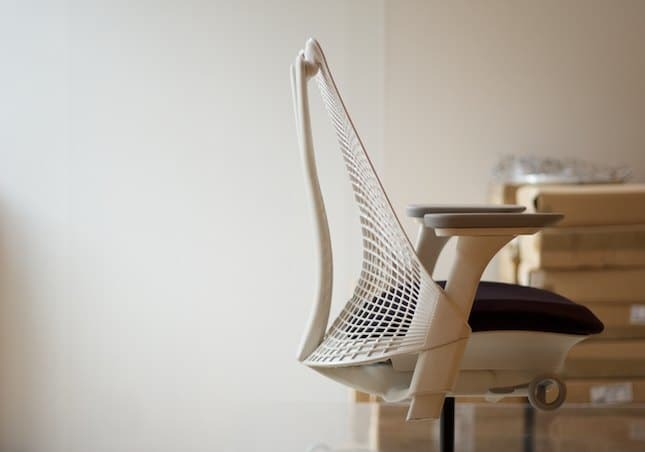 As you may expect, this chair puts function over form. The chair isn’t unattractive — in fact, Haworth commisioned the German design company Ito design for assistance — but its focus on science and ergonomics is what sets it apart. The Zody chair features a unique asymmetrical adjustment system designed with the University of Michigan’s Human Performance Institute, which allows you to target problem areas like the lower back and make the chair conform to your body. This chair also gets high praise for its passive pelvic support that helps you maintain corrrect spinal alignment. This simple pad helps you maintain the natural curvature at the small of your back to make lower back pain a thing of the past. If you prefer to recline, an optional headrest is available. While the chair’s main selling features are its passive pelvic support and ability to adjust the lumbar for the left and right side of the back independently, you also have the standard chair adjustments. This includes adjusting tilt, arm rest width and height, seat height, and tension. This video gives you a full introduction to the Zody chair. Not everyone can afford to spend $1000 or more on a chair. That doesn’t mean you should have to settle for an inferior product. 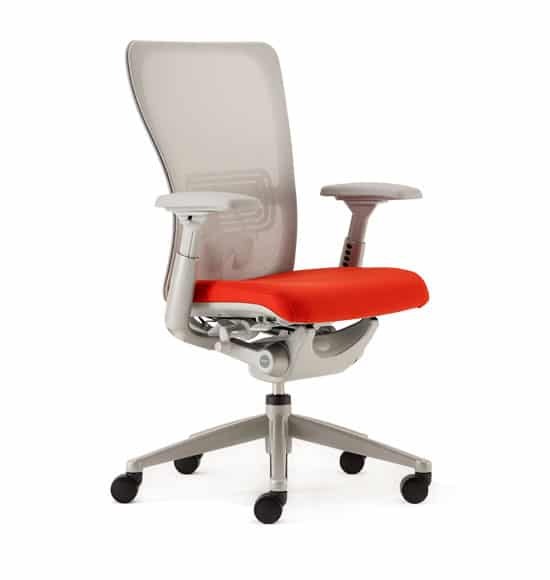 In fact, the Leap Fabric Chair is the best selling ergonomic chair Steelcase produces. This means you can be confident that you are purchasing a reliable and comfortable product. 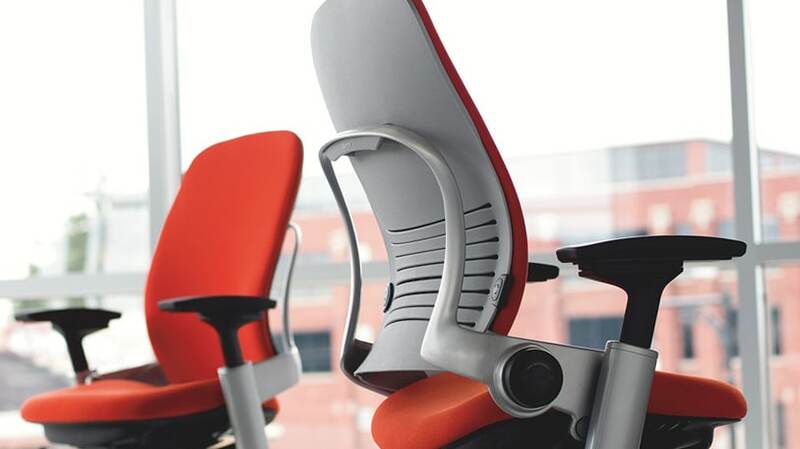 One of the best features of this chair is Steelcase’s patented LiveBack technology. That means that this chair actually conforms to the shape of your back, offering much-needed support and keeping you comfortable for longer periods of time than ever before. The chair also glides to accommodate your posture as you change position or recline, helping to keep your work in focus while helping your back and neck stay comfortable and pain-free. Not only does the Leap Chair conform to your body and move with you in ways no other chair does, it is also sustainably produced. No less than 30% of the chair is made from recycled materials, and over 90% of the chair is recyclable, meaning that when this chair does finally give out, the materials can be reused, providing very limited environmental fallout. Every part of the chair is flexible, from the upper back to the lower back, the arms to the edge of the seat, from the height of the seat to its depth. Each chair allows full optimization so that every user can enjoy the same support and comfort as their coworkers. For the price, there is simply no better office chair. Herman Miller is responsible for the first ergonomic chair, and this high-end brand is known for producing some of the best chairs in the world. The Herman Miller Sayl Chair is the brand’s most affordable office chair, which already puts it a cut above most chairs in this price range. Designed by Yves Behar, the Sayl chair comes in many colors and it’s made in the United States from recyclable materials. 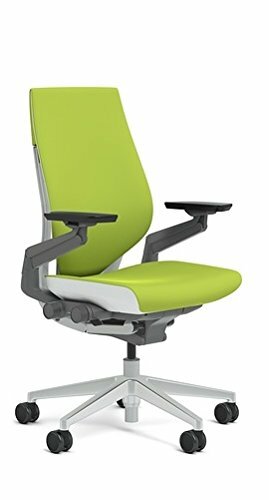 This beautiful “life unframed” chair combines ergonomics with design and superior engineering with two unique innovations: the Y-Tower and ArcSpan. Behar was inspired by the Golden Gate bridge and its ability to carry massive loads. This inspiration is clear in the design. The Y-Tower feature is the backbone of the chair, stretching the fabric while offering support. The ArcSpan provides shape to the back while anchoring the unique suspension fabric in place. As it’s the most budget-friendly Herman Miller chair available, it doesn’t have many of the adjustaments and other features you get from most models with this brand, but it will still impress. While best known for their mattresses, Serta has moved into ergonomics with the Serta Back in Motion Health and Wellness office chair. This reasonably priced chair has the look and feel of a high-end brand with deep, ergo-layered body pillows that offer the perfect combination of comfort and support. The chair is made from eco-friendly bonded leather with a BIM Active lumbar that pivots as you move for continuous lumbar support. Adjust the height of the padded armrests with the push of a button, and use the convenient cable actuated levers to control the lift and lock-out features. The Serta Back in Motion chair also offers unique posture-correcting tilt technology that actually tilts your pelvis forward when you lean. This keeps your back in a beneficial neutral position to avoid pressure on your discs and promote spinal movement. After a few days, you’ll start to feel the benefits of a comfortable and supportive seat that can get you through your long work day. Welcome to comfort with the Alera Elusion swivel chair. This is the most well-reviewed chair in this price range with an ergonomic design and a breathable mesh back to keep you cool and comfortable all day long. Unlike many chairs at this price, the Alera chair offers a contoured seat cushion with a waterfall edge and premium upholestery that helps take pressure off your legs, while the supportive back encourages proper posture to alleviate lower back pain. The Alera chair lacks many of the adjustment features of more expensive chairs, but you can adjust the tilt tension, seat height, and arm height and width to adjust the chair to your body. This chair was designed to give you a professional, efficient working environment at a good price, and it certainly delivers. 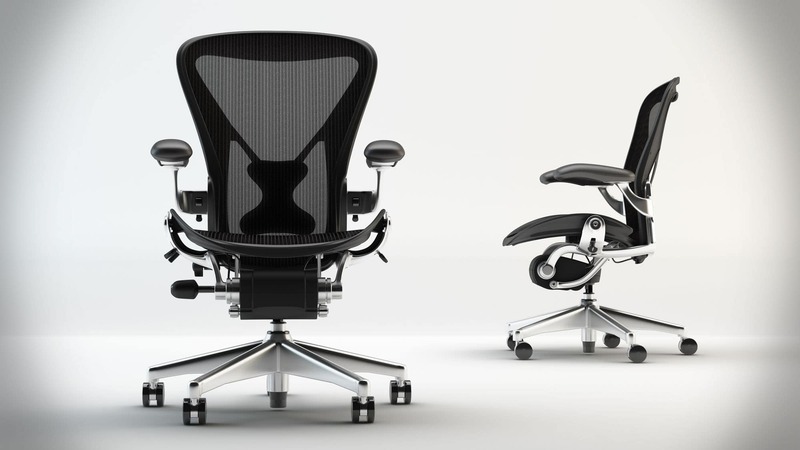 This video walks you through the features of the Elusion series office chairs. The Flash Furniture Mid-Back Mesh Chair is a rare find: a well-reviewed, comfortable chair that fits any budget. This chair features a sturdy five-wheel base with a mesh ergonomically contoured back that gives you the support you need to get through a full day of work. One of the most surprising things about this chair is the fact that it’s actually sized well for larger people taller than six feet, which is a rare find in an office chair priced under $100. Chronic neck pain is a common complaint among people who spend hours a day in a chair, either bent over paperwork or working in front of a monitor. The right ergonomic chair can help correct poor posture by supporting spine health. 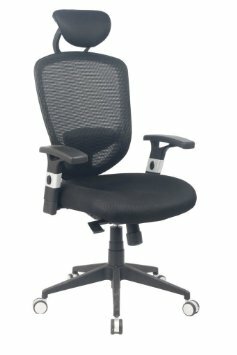 The best office chair for neck pain offers support for the spine and, most importantly, adjustable height and tilt to avoid craning your neck to see a computer screen. 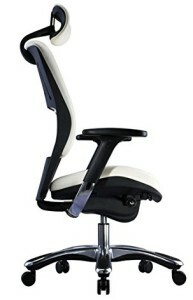 The White Ergonomic Leather Office chair has a very unique style that quickly sets it apart from the pack. Combining the ergonomics with luxurious genuine leather makes it the right pick for your office. It is fully adjustable with features like seat slide adjustment, tilt tension, headrest heigh and angle adjustment for those suffering neck pain. The 3D armrest also has adjustable height and can be moved forward or backward to suit your sitting style. 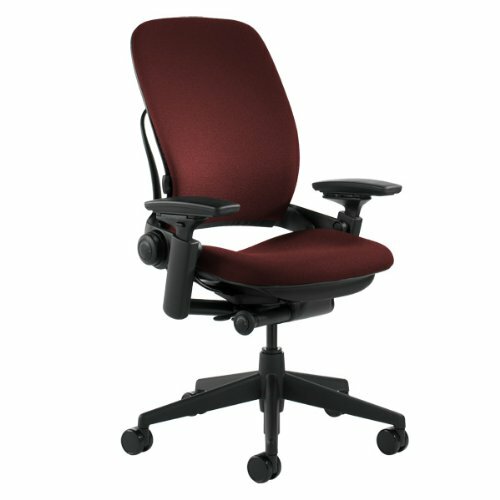 The distinctive design offers support to both back with unique lumbar support system and neck with height adjustable backrest. 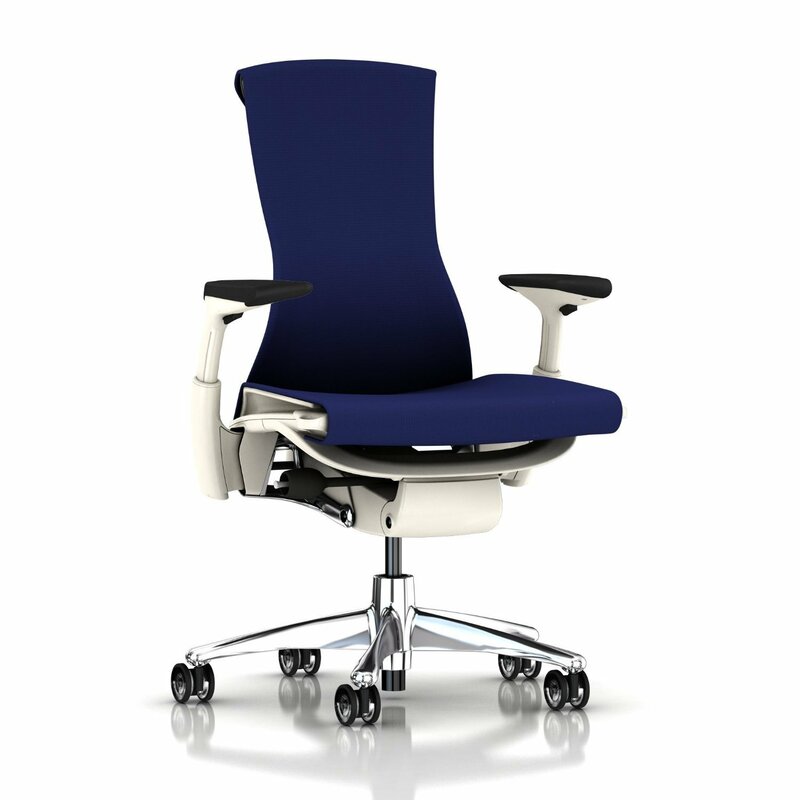 Another great option is the Ergohuman chair by Eurotech Seating. Right away, you’ll notice the unique design of this chair, which features eight ergonomic adjustments to keep your neck and back aligned all day long. The Ergohuman has breathable mesh to promote circulation with the ability to adjust the back angle and height, tilt lock, tilt tension control, synchro tilt, arm height, and seat depth and height. The headrest adjusts up and down so you can position it to hit your neck perfectly, with a curvature that supports your head and neck when you lean back. 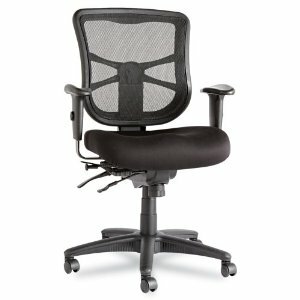 You may also appreciate the unique features of the Balt Butterfly Executive Chair, which offers a mesh back that includes angle and tilt adjustment. The chair’s back is perfectly contoured to provide natural lumbar support, while the curved headrest can be adjusted by both height and angle to give you the proper neck support whether you are upright or reclining in the chair. The arm rests also pivot and adjust by height so you can work in a variety of work spaces. Whether it is checking emails, filling out expense reports or designing the next marketing plan for your company, you want a chair that you can last on for the whole day. There’s nothing worse than plunking down a good amount of money for an office chair and discover it can’t adjust to your size requirements. This is why 9to5 by Humano is the best ergonomic chair you can get for the price. It is the only chair in this category that has all the features of big-name brands e.g. You can raise the height of the seat, so feet are right on the ground, arms can be adjusted to fit the best height, and even the seat depth will conform to your own comfort requirements. Possibly the best-selling factor on the chair is the adjustable neck brace. The headrest is an actual attachment on the top of the chair. You can adjust it to best fit where your own neck and head come in contact. 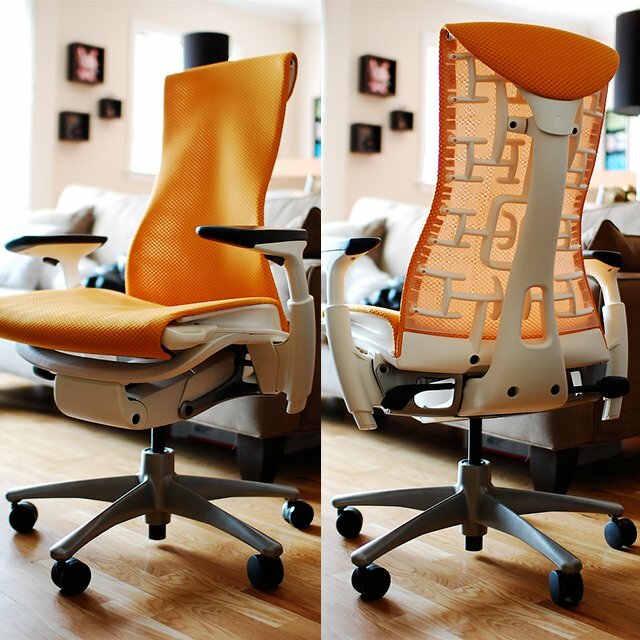 The mesh backing of the chair helps aid in its comfort level as well. If you spend more than just a few hours sitting at a time, your back pressed against fake leather or fabric is not good for letting your skin breathe. You already know what this problem is like if you’ve ever suffered from back sweat at work. 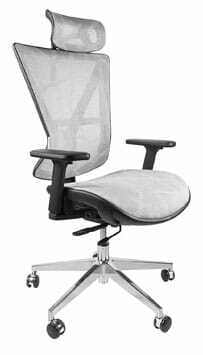 With the Full Mesh High Back Executive Manager Office Chair, the entire back is made from a clear mesh material. This allows air flow to circulate around your back and neck, keeping you not only comfortable but dry throughout the workday. 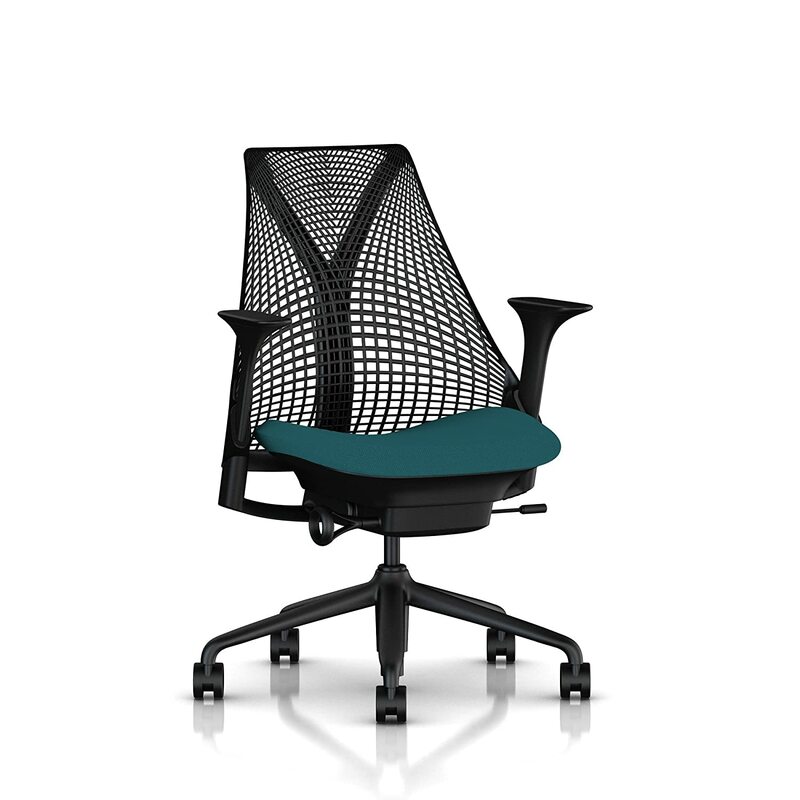 The Viva Office Mesh High Back office chair is the perfect blend of features and price. The chair has an ergonomic mesh back that avoids excessive heat and moisture build-up, along with pneumatic height adjustment and adjustable armrests. The headrest is fully adjustable so you can periodically lean back to rest your head and neck as you work. The Viva Office chair is one of the few ergonomic chairs at this price range that works for people who are taller than six feet. The “Walker” adjustable office chair by The Green Group is hard to beat in its price range. The “Walker” features 360-degree swivel motion with a stable five-wheel base and the ability to recline with the flip of a lever. 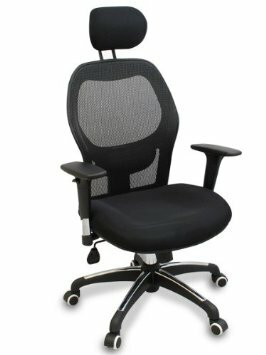 This chair was designed specifically to support the neck to avoid neck strain with a unique curved, adjustable headrest that supports your head and encourages proper alignment when you lean back. 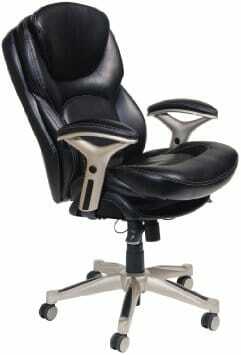 The padded headrest, arm rests, height, and lumbar support are all fully adjustable. Shopping for an office chair on a budget does not mean you need to sacrifice comfort and health. 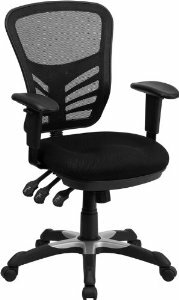 The AmazonBasics Mid-Back Office Chair features adjustable seat height that’s combined with an upholstered in black bonded leather and padded seat and back for all-day comfort. 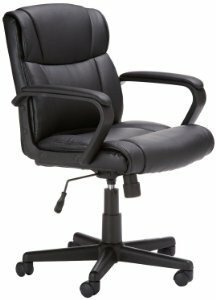 It has dual-wheel casters for easy movement and it is the best office chair you can get for under $100 by Amazon itself. If you work on computer then you definitely need to invest an a good ergonomic chair. As discussed above, Herman Miller Chairs are top notch as they are backed by years of research and testing (see here) but if it is out of your range, we’ve covered a whole lot of others so make sure to keep this when making a purchase. Do share in the comments below and let us know which chair you like the most. As always, your feedback is greatly appreciated.